Sloping stonework can comes in 2 patterns. 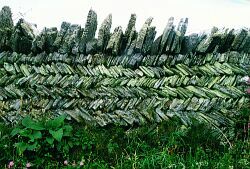 Herring-bone is found primarily in North Cornwall where the slate is the ideal material for this type of structure. 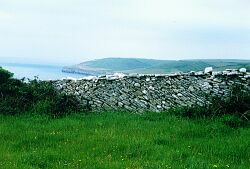 This wall near Tintagel is 44" high plus its 10-20" coping. It is quite wide with the slates in the top course on each side around 8" (20 cm) long and more or less meeting in the centre. The resultant structure is very tight and solid. A.Clifton-Taylor and A.S.Ireton ("English Stone Buildings") note a mortared section of herring-bone wall at Richmond Catle. It is thought this section dates back to the 11th. century. A more random form of sloping stonework, rarer than the herringbone pattern can be found on parts of the South Purbeck Coast, Dorset. 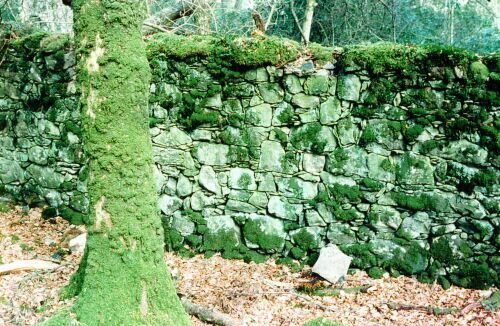 The use of vertical stonework is common in stone hedges and cloddiau, that is stone faced earth banks. See ****ADD CLODDIAU LINK**** for more information on this. It is however, rare in dry stone walls, although perhaps not surprisingly the occasional dry stone wall or section of wall with either courses or random vertical stones can be found in areas where similar patterns dominate the stonework of the local stone hedges. 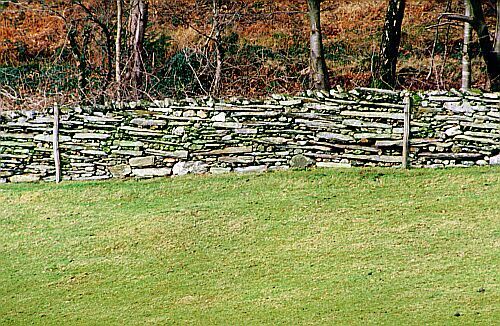 In Britain true polygonal patterns are almost exclusively confined to mortared walling. 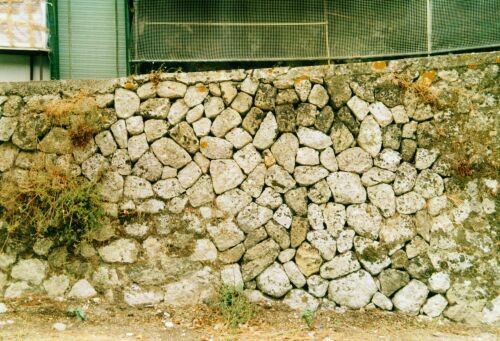 In this pattern the stones are not all laid to the same axis, as can be seen in this example from Paleokastritsa, Corfu (below left). This is a common pattern throughoutthe Greek mainland and Islands. As a practice here it dates back thousands of years as can be seen in the example right from Ancient Delphi. Here the stones have been cut with amazing accuracy to achieve an extremely tight finish. 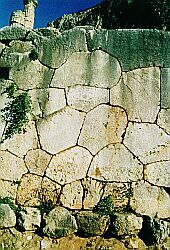 Whilst the setting of the stones off of the horizontal might be deemed a weakness this can be more than compensated for by the if care is taken in fitting the shapes together to form a tight face. It should theoretically be possible to produce a tighter face than with with a more traditional random pattern built with the same stone, although it will require a high level of skill. 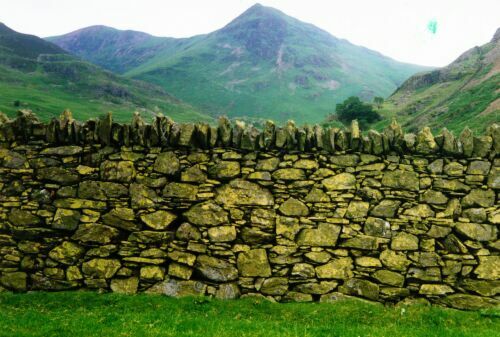 Several writers refer to `cyclopean walls` in the Lake District and North Wales. 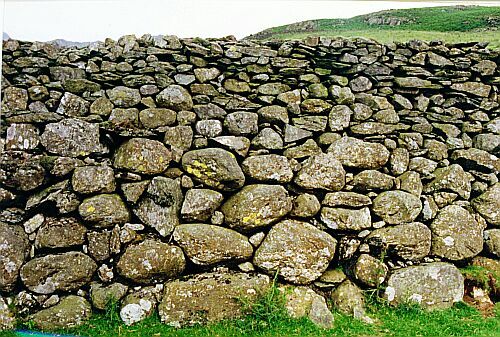 These are walls containing large boulders such as this example near Far Kiln Bank above the Duddon Valley. 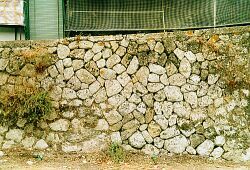 Here the first 5`6" of the wall is comprised primarily of boulders, most of which form a retaining wall. 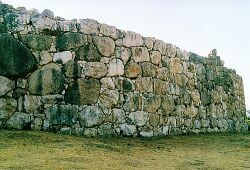 The total height including the wall on top of the retaining sections reaches just over 9` (2.7m) at its highest point. It seems likely that the term cyclopean comes from Mycenaen fortification walls (shown below left and right). G.E. Mylonas in "Mycenae: A guide to its origins and history" (Athens 1976 p.10) explains that these walls are comprised of roughly shaped stone piled on one another and are "of so large dimensions that the ancient Greeks maintained that only Cyclopes (sic), with super human powers, could have moved them into position." According to legend the Cyclopes carried out this task for Perseus (son of Zeus and founder of Mycenae) in the early 14th century BC. Many of the granite dykes (walls) of Aberdeenshire are coursed. 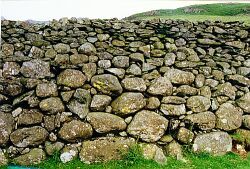 The coursing varies from regular to virtually rubble depending on the regularity of the granite blocks or boulders. the walls are striking for the sheer size of stone used. 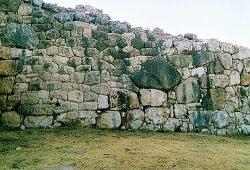 The thin stones used to ensure the stones sit solidly are a feature of most of these walls, even the more regularly coursed ones, although in a fewer numbers. The use of thin levelling stones, a form of `pinning` (see p... <<THIS CHAPTER>> can sometimes be found in random walls such as this estate wall near Llanwrtyd in Powys, Mid Wales. 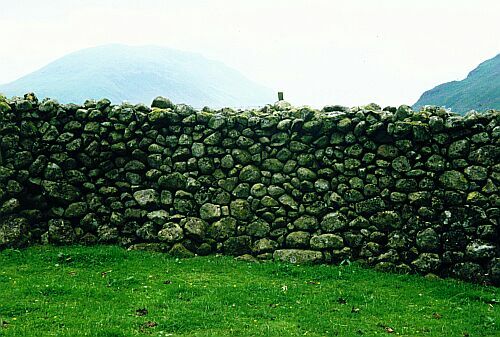 This wall and the following sequence from the Lake District illustrate how similar stone can result in a variety of patterns. In this wall in Buttermere The thin slates form pockets, between the larger stones, whilst in the following example near Mungrisdale, they are more evenly spread throughout the wall, levelling off steps rather than filling gaps. 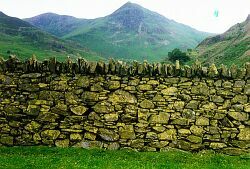 In Borrowdale the slates tend to be fewer and thicker, and used randomly as any other building stone rather than filling gaps or levelling. Around gardens this pattern becomes more formalised, with the slates used to form distinct layers, so that the wall is virtually coursed. 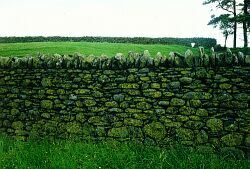 Here the longer stones are often several feet long and quite narrow. This `tracing` could be a severe weakness, however many of the smaller stones are in fact through-stones and the resultant structure is quite durable. <<PHOTO AB>> >I'M NOT SURE EXACTLY WHERE THE NEXT TWO BITS FIT IN TO THE FORMAT I'VE COME UP WITH, BUT ARE WORTH A MENTION. DIFFERENT PATTERNS ON EITHER SIDE, WHILE NOT PARTICULARLY COMMON IS NOT EXACTLY RARE, ESPECIALLY ON WALLS WITH DIFFERENT BATTER ON EITHER SIDE. THE OGILVIE EXAMPLE, WHILST A LITTLE QUAINT, IS A GOOD EXAMPLE OF THE SORT OF HIGHLY LOCALISED PATTERN WHICH WOULD BE LOST IF YOU'RE NOT CAREFUL AND IS A PRIME EXAMPLE OF WALL PATTERNS FROM A CONSERVATION POINT OF VIEW. Ogilvie (1996, p.12) shows what could well be a unique pattern found in the Fyling Park Estate Wall, Fylingdales, North Yorkshire. 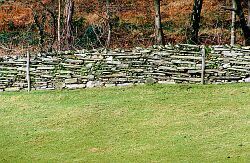 Around every 50` along the length of this wall long stones have been set to form a cross visible on both sides. The park was originally created in the 12th Century by the Abbot of Whitby, and it is thought that the crosses could symbolise the monastic ownership of the Park.